There are many skin care products on the shelves today for men. With an endless array of options, it can be difficult to make a decision, especially when it comes to items that target aging skin. However, it is possible to find a wrinkle cream that works effectively and is specifically designed for men. A common assumption is that that men's and women's skin are the same. The reality is that they are dramatically different. Men's tends to be thicker, have a higher collagen density, and be more sensitive (due to regular shaving). That means the ingredients in certain products, like facial cleansers and shaving gels, must address those specific issues. When it comes to wrinkle creams, however, there is no true difference between products for men and women. At What Age Do Wrinkles Appear? In fact, the only way to differentiate between the two are smell (many items for women include an artificial fragrance) and packaging (products are packaged to appeal to each gender). Celebrity aesthetician Renee Rouleeau says that men and women can share anti-aging products like wrinkle creams, so long as they have the same skin type. The best male wrinkle creams are not only healthy for the skin but are effective at preventing and/or minimizing wrinkles. You can choose products made for the face, or targeted for specific spots such as the eye area. 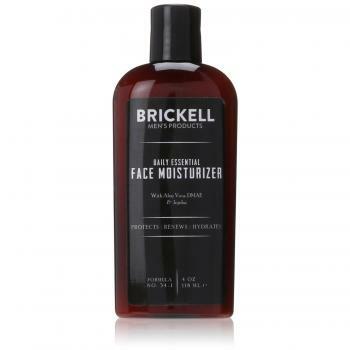 One highly regarded product is the Brickell Men's Daily Essential Face Moisturizer. This has been featured in both Men's Health and Men's Journal - and has overwhelmingly positive reviews on Amazon.com. Designed to work with all skin types, this product is full of natural ingredients. It contains aloe vera to give added moisture as well as jojoba oil to reduce water loss, vitamins A, E, and F to target fine lines and wrinkles, and green tea to provide anti-aging antioxidants. There are many reasons men are reaching for this. It has a light citrus scent, is quick drying, non-greasy, and helps to prevent and reduce the appearance of wrinkles. (It is important to note that this product does not offer any sun protection.) To use, apply the moisturizer to the face and neck first thing in the morning after shaving. The skin will look smooth and feel hydrated throughout the day. The price of a 4-ounce bottle is $35. 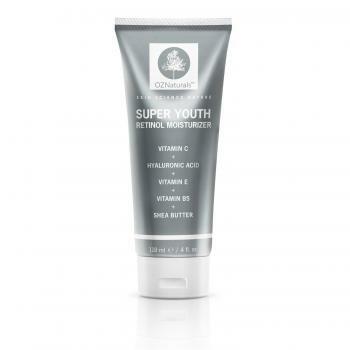 This next wrinkle cream was featured on Men's Health as one of the best anti-aging products for men. 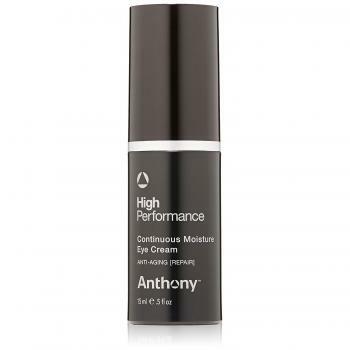 The Anthony High Performance Continuous Moisture Eye Cream targets the area around the eyes. Since the skin here is naturally thinner, it often shows the first signs of fatigue and aging. That makes it especially important to have an eye cream that leaves it firmer while providing moisture and reducing the appearance of under eye circles. This is a time-released formula that contains arnica and allantonin (which reduce puffiness around the eyes and boosts circulation), jojoba oil, shea butter, and vitamins A, C, and E to firm the skin and eliminate fine lines. For best results, this should be used in the morning and at night. Although reviews are limited, those that have reviewed the product praise its effectiveness and the price per tube. While it retails at $38 for half an ounce, only a small drop is needed. If you are looking to reverse signs of aging rather than prevent them, retinol is an essential ingredient. According to Elizabeth Tanzi, M.D., of the Washington Institute of Dermatologic Laser Surgery, retionids are the only anti-aging ingredient that have been proven to work on a molecular level. The Oz Naturals Retinol Moisture Night Wrinkle Cream is effective because it contains retinols, a gentler type of retinoids, and is a popular choice for men. In addition to retinol, it also contains vitamin E, vitamin B5, and green tea. This combination of ingredients can provide noticeable results. Since this is a retinol infused product, it may cause a reaction on people with sensitive skin. Start slowly and do a test patch before applying it all over the face. This should be used at night before bed, either every day or every other day. Top Rate Ten names this as one of the top ten wrinkle creams, and according to Skincare Reviews, it absorbs quickly, creates softer and smoother skin, and that a small amount goes a long way. At $21 for a 4-ounce tube, this is an effective and budget friendly choice. It is possible to find great anti-aging products wherever you go. 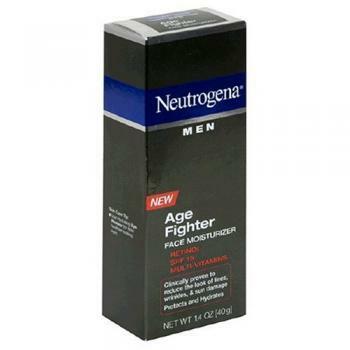 For instance, the Neutrogena Men Age Fighter Face Moisturizer can be purchased online and in most drugstores. It is certainly one of the most affordable and easily accessible wrinkle creams for men, coming in at just $13 for a 1.4 ounce tube. Not only does it have an SPF 15, but it contains retinol and a combination of skin smoothing vitamins. Users found it to be non-greasy, hydrating, and effective at reducing the appearance of wrinkles. Many also believed scars and imperfections were lessened through continued use. The cream gets a solid 4.4 star rating on Google shopping reviews. However, some reviews point out that this may not work well for people with sensitive skin due to the addition of retinol. In those cases, the cream can cause a stinging sensation or a mild reaction. For best results, this should be applied all over the face each morning. One well known skin care brand is Kiehl's. They offer a variety of products for both men and women, including the Kiehl's Facial Fuel Anti-Wrinkle Cream. This lightweight treatment is made with soy and chestnut extract and includes Vitamin C, E, and citrus. These ingredients create a firmer appearance and reduce fine lines and wrinkles. Kiehl's has received many positive reviews for their Facial Fuel line, gaining praise for their longevity (the brand has been around since 1851), effectiveness, and even scent. Not all reviews are glowing though. Some point out that alcohol and dye are used in the wrinkle cream - which can be hard on sensitive skin. This cream can be applied morning or at night and costs $36 for a 1.7-ounce jar. The desire to slow down the effects of time is hardly a new concept. The history of anti-aging treatments dates all the way back to the Cleopatra's reign, when she would take daily baths in donkey milk to keep her skin healthy and youthful. These days, both men and women rely on products like creams and serums. Great skin is achievable for all men. By using effective wrinkle creams, fine lines and wrinkles can be dramatically reduced.